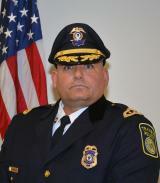 Deputy Chief Sean D. Reynolds joined the MBTA Transit Police in 1999. In 2005, he was promoted to the rank of Sergeant where he served as a Patrol Supervisor. In 2012, he was assigned to the Professional Standards Unit and promoted to Sergeant Detective. His previous assignments included Field Training Officer, Communications and Booking Supervisor, SWAT Supervisor, and Professional Standards Supervisor. Deputy Reynolds holds a Bachelor degree from Westfield State College and a Masters Degree from UMass Lowell.